One hundred and sixty-nine years ago, the third bishop of Philadelphia was nakedly intentional and ambitious in dedicating his planned cathedral to Saints Peter and Paul. Having settled the trusteeism wars which marked Stateside Catholicism's greatest internal crisis until recent times, then shepherding his growing flock through the burning of the city's churches, Francis Kenrick's Romanesque temple on the city's western frontier would be the embodiment of a new structure, literally a fortress church, with an authority able to withstand assault from within or without. The first American bishop to be trained in Rome, the Dublin-born missionary's project of an institution-centric Catholicism built as womb-to-tomb service center would become the global church's most sprawling showcase of Catholic education and social work – an empire which endured for nearly two centuries and produced two saints... only to collapse under the weight of the clericalism which underpinned the enterprise, and its creation of an anesthetized laity: a "perfect storm" culminated in a decade of abuse scandals, two grand juries and widespread parish and school consolidations. 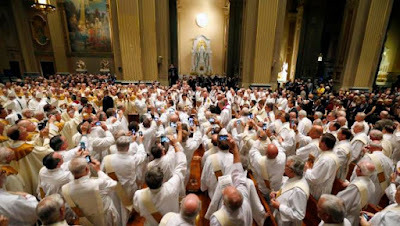 In a nutshell, getting this place back on its feet – and even more, renewing God's house in Rocky's city for a new era – is the reason the Eighth World Meeting of Families, and by extension this papal visit, have come to the place Rome's long seen as its staunchest US bastion... yet only now, ten bishops since its builder, for the first time the chair of St John Neumann will be occupied by the Bishop of Rome for the celebration of Mass.